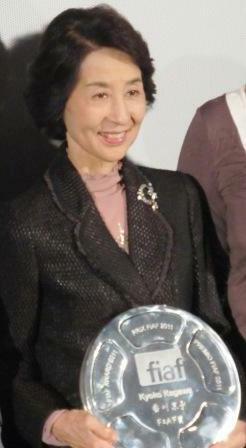 Famed Japanese acress Kyoko Kagawa, known for her work with some of the greatest Japanese directors in the "Golden Era" of Japanese film history, such as Ozu, Kurosowa and Miziguchi, was given the prestigious FIAF award this morning at the Tokyo International Film Festival. She is the first Asian actress to be given this award, but not the first born in Japan, quipped the presenter of the award, noting that Liv Ulman, who received the award last year, was born in Tokyo. The stunningly beautiful actress -- renowned for her expressive gentleness -- now aged 80 -- stood gracefully on the stage with the same modest soulfulness she displayed in the films she made with these masters of Japanese cinema. Accepting the award, she spoke about how important it was that these films are now preserved in archival form: a statement of gratitude for the International Association of Film Archives (FIAF) which sponsored the award, which was a silver cup made out of a film canister. The ceremony was followed by a screening of Kenji Miziguchi's 1954 film The Crucified Lovers, the screening of which is enough to inspire a visit to Japan. The story of a patriarch's well-run home and scroll-making business, quickly gone corrupt, with adultery and forgery challenging the order of the household, it is crisply told in black and white stark images of people anxiously confronting the insecurity that lurks in their midst. As a tale of how human beings need to fit into their society, repressing their urges and fearful of exile, it is excruciatingly universal, speaking to the director's power to show the worries that generate beneath the surface of even the most conventional setting. Already the opening shot alerts us to this anxiety, as the master's servants are worried they will not produce the almanacs in time for a local government official. Then we have the riveting Kagawa, worried about being able to get enough money to help her indigent brother and unable to ask her own rich husband directly for the funds. He, on the other hand, is sticking his hands up the kimono sleeves of one of his gorgeous indentured servants -- who in turn is in love with the main printer of the business. The plot is alive and energetic from the very first scene, the shots (by famed director of photographer Kurosawa) as cleanly beautiful as a wood-cutting, and leaves the audience breathless -- leading to a climatic moment of escape by two of the household, through a poetic marsh in the mountains, by nightfall. A masterpiece. "I was very lucky to work with these directors," commented Kagawa humbly. "I see these old pictures not with nostalgia, but as old friends. 'I am so happy to see you!' I say."